More happy news, this time from Nokia. 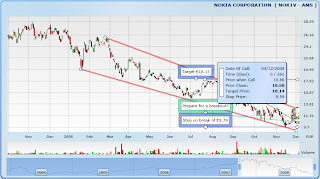 HELSINKI (AFP) - Nokia (Xetra: 870737 - news) , the world's leading mobile phone maker, on Thursday lowered its outlook for the global cell phone market this year and offered a bleak forecast for 2009. "The mobile device market slowdown has continued more rapidly than previously expected," Nokia said, adding that it "now estimates that fourth quarter 2008 industry mobile device volumes will be lower than the previous estimate (it gave last month) of approximately 330 million units." 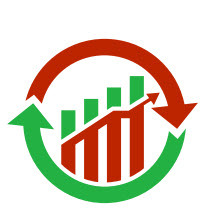 Market participants look to have shrugged off the news with buyers unwilling to step in to halt the slide. There is a chance for bulls to break resistance from September highs through to December which can generate a push to €13.40 (larger declining channel resistance). One for short term traders. On Zignals Stock Charts, YourCall, there is only my opinion for a push to €18.15 with a stop at €9.59. 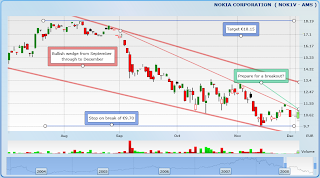 If you have an opinion on Nokia (or any other stock) we would love to hear it - sign up for free at Zignals, head to Charts and make YourCall.